Police have charged a delivery truck driver for careless driving in connection to a severed hydro pole in Belle River. Lakeshore OPP have charged a 48-year-old Windsor man in connection to downed power lines in Belle River. The man was driving a delivery truck that had a large boom attached. 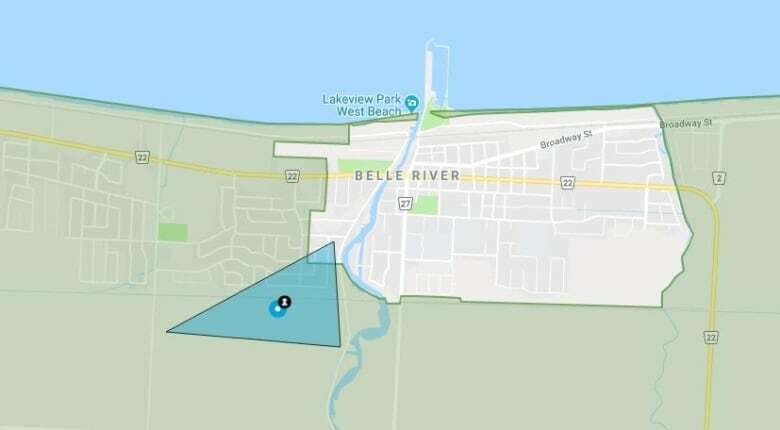 A hydro pole was severed, which caused a "significant hydro outage in the Belle River area and a closure of the rail line that crosses the road way," police say. The driver and his passenger had to remain inside the truck for more than two hours because severed wires had falling onto the roof of the truck. "Safety is our first priority," said Alicia Sayers, media relations for Hydro One, noting that crews were on the scene to de-energize the line. Police charged the driver with careless driving and operating an over height vehicle. Just under 50 residents are without power in the area. Power is out at Belle River District High School as a result of the downed wire but it was "business as usual," according to the Greater Essex County District School Board. West Belle River Road between County Road 42 and Parklane Drive will be closed for the rest of Monday for hydro repairs, police say. The telephone lines for the Lakeshore detachment of the OPP are currently down. Lakeshore OPP can still be reached by calling 1-888-310-1122 through the 24-hour communication centre line. The bucket lift operator was not injured. West Belle River Road from County Road 42 to Parklane Drive was closed while emergency services responded to deal with the downed line and assist the worker. A previous version of the story said the person who was stuck was a bucket lift operator and may have been trapped in the bucket. However, police say the driver and the passenger were stuck inside the actual vehicle, not the bucket. The story has been updated to reflect that change.